Complete original album of ‘Strangest Things’ – 12 tracks including singles ‘No More Conversations’ (Original version), Eeeeaaooww (feat. Bounty Killer), Electromagnetic and Slow. Also includes bonus album of 11 remixes including the classic Mylo remix of ‘No More Conversations’. Additionally, remixes from Tiefschwarz, Lindstrom, M.A.N.D.Y and the legendary Heaven 17. Every version of the first single from the album, also entitled ‘Strangest Things’. 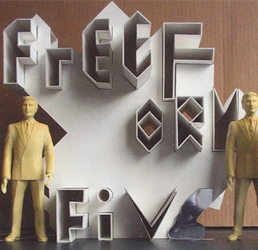 Album version, Radio Edit and remixes from Grand National, M.A.N.D.Y, Six Fingers as well as Anu’s own radically different ‘Freeform Reform’. Monster package of 9 versions of ‘No More Conversations – covering all the remixes and versions from both the original release and the latter chart bound release. In the package are both Mylo versions – the full length and the radio edit, two versions from Fedde Le Grand and mixes from Subliminal Kid, Switch, Nightmoves, Radiokillaz and Mason. 5 versions of ‘Electromagnetic’ – the album version, two versions from Seiji, an unreleased Tiefschwarz remix and the stand out rework from Lindstrom. Many people’s favourite track from the album and these mixes are not available anywhere else. The impossible to spell ‘Eeeeaaooww’ came in two basic versions – the original version with just Freeform Five’s troupe of singers and the latter version featuring Bounty Killer. Both are included in this package. Also includes remixes by Stanton Warriors and Radioslave as well as Anu’s VIP version. All of the above……..quite literally. This bundle is all of the packages on this page at a massive discount. 45 tracks from the ‘Strangest Things’ album and singles. Every version available and downloadable as full highest quality WAV’s. The album and all versions of all the singles. A limited time offer.